Dr. Matt Heilala and Stan James will be competing in the 2017 Iron Dog snowmobile race. Alaska Foot & Ankle Specialists is the proud sponsor of Team 37. This year, Heilala and James are competing in the Iron Dog pro classification on Ski-Doo MXZ X-RS 600 snowmobiles. The Iron Dog snowmobile race has earned its title as the world’s longest and toughest snowmobile race. 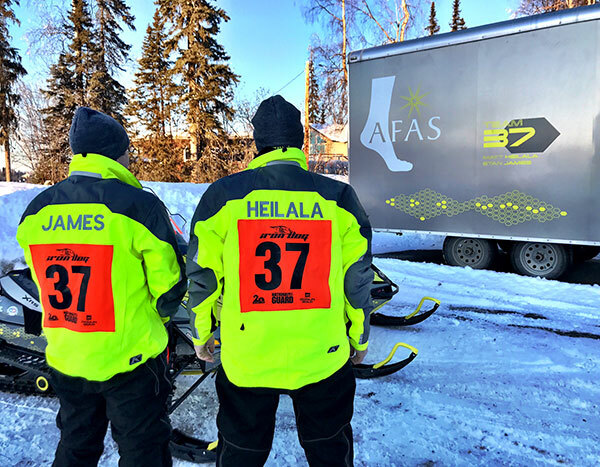 Team 37 will navigate over 2,000+ miles through rugged terrain, fierce weather, unforgiving wilderness, deep snow, snowless stretches and extreme subzero temperatures. Team 37 will take the green flag as rookie pro class riders on February 18, 2017 during the 2017 Iron Dog Race official start in downtown Anchorage, Alaska. The restart will occur on February 19th, 2017 in Big Lake, Alaska. Alaska Foot & Ankle Specialists wish Dr. Heilala and Stan safe travels all the way to Fairbanks Alaska.